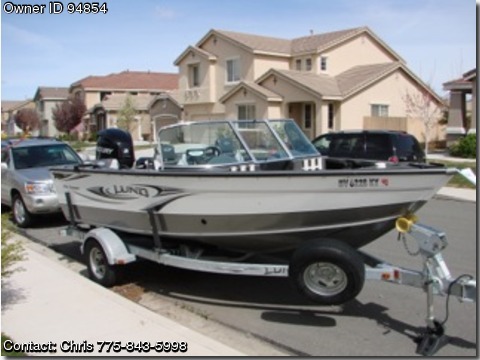 Call Boat Owner Chris 775-843-5998. For sale by original owner. Asking 34,000 retail value 45,000 or best offer. Lund 1750 Fisherman in excellent condition. Only 50 hours, extremely well cared for, lots of extras. 150hp Mercury 150 XL Verado 13,000 new with smart Gauge including troll control, Mercury 9.9 Pro Kicker 3465 new, Minn Kota Power Drive V2 70 lb. thrust 24 volt electric trolling motor, full canvas whider, seat upgrade, air ride upgrade, Shore Land'R boat trailer 2,660, galvanized spare tire and bracket, 3 bank on board battery charger, sport packagecockpit coversc upgrade 2185, Ski Pylon 434, kicker pre-rigsecond driver throttle with tilt and starter 1,650, two live wells, rod storage locker, full bow seat cushion inserts, and many more upgrades. Must see Call Chris at 775-843-5998, or email me at cantlons@att.net. " boat is allready retrofit for ski boat"